The most recent UN Intergovernmental Panel on Climate Change (IPCC) report saw perhaps the most severe conflict between scientists and politicians in the organisation’s existence. 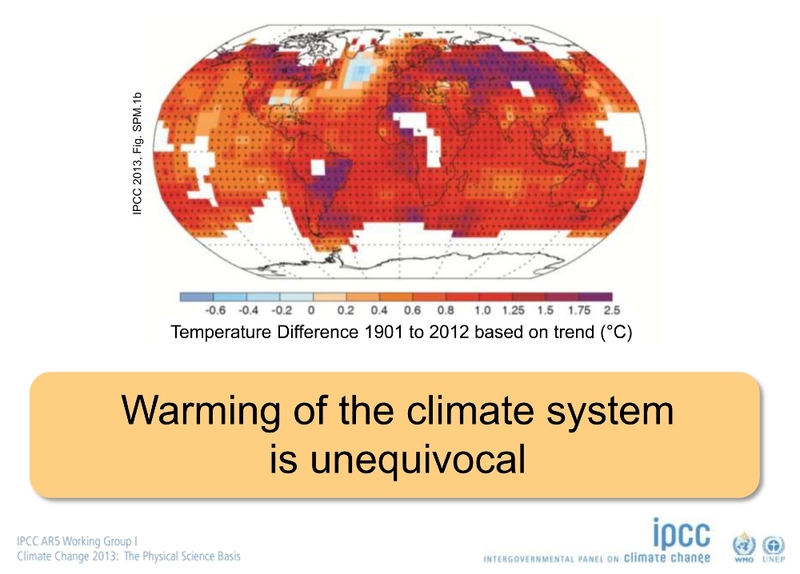 As its name suggests, governments take an active part in the IPCC process, whose latest main findings appeared between September 2013 and May 2014. Debate over what information makes the high-profile ‘Summaries for Policymakers’ is usually intense, but this time three graphs were dropped on politicians’ insistence. I show these graphs later in this blog entry. At the Transformational Climate Science conference in my home town, Exeter, UK, earlier this month, senior IPCC author Ottmar Edenhofer discussed the ‘battle’ with governments on his part of the report. 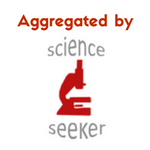 Another scientist who worked on the report highlighted confidentially to me how unusual the omission was. To me, it’s more surprising that this hasn’t happened more often, especially when you look more closely at the latest report’s findings. There’s concrete certainty that warming is happening, and it’s extremely likely that humans are the dominant cause, it says. Governments have even – in some cases, begrudgingly – already signed up to temperature and CO2 emission targets reflecting this fact. The inadequacy of those words is becoming ever more starkly obvious. Ottmar stressed that the emissions levels agreed at the United Nations’ Climate Change Conference in Cancún, Mexico, in November 2010, would likely need later emissions cuts the likes of which we’ve never seen before to avoid dangerous climate change. The latest IPCC report shines a floodlight on that inertia, which understandably cranks up the tension between researchers and politicians. Ottmar was one of two co-chairs who led the ‘working group three’ (WGIII) section of the IPCC report that looks at how to cut greenhouse gas emissions. He stressed that the need to make these cuts comes from a fundamental difference between the risks that come from climate change and the risks of mitigation. We can heal economic damage arising from cutting emissions – reversing sea level rise isn’t so easy. 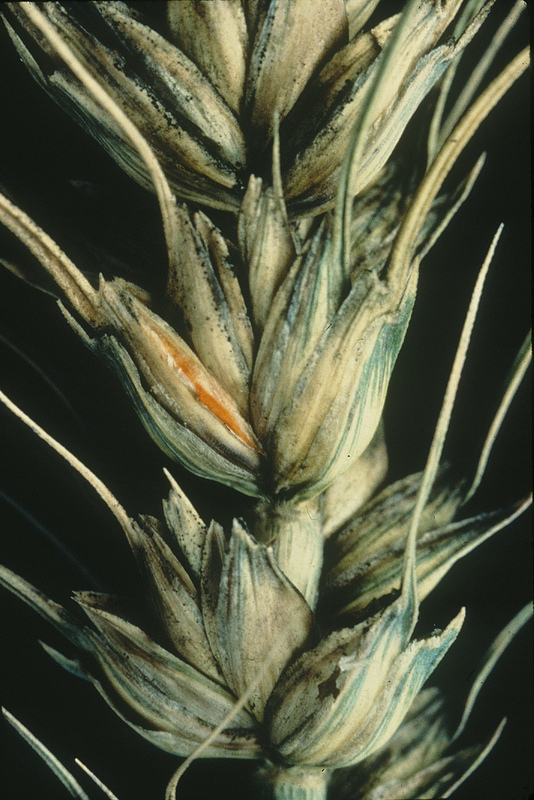 Wheat ear infected with Fusarium ear blight (FEB), giving the ear a pinkish color. The disease could be set to increase in countries like China and the UK with climate change, Bruce Fitt and his teammates have found, suggesting resistant varieties should be developed. 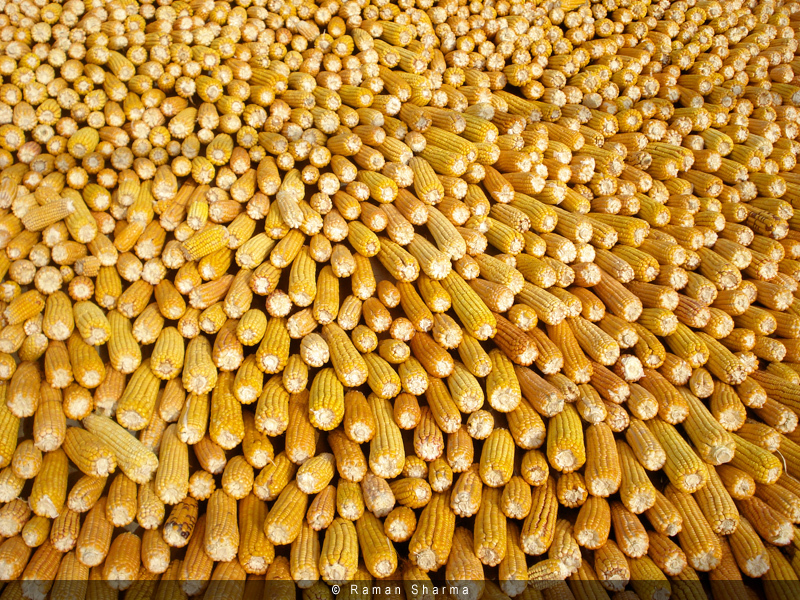 Photo credit: CIMMYT. Today, over a billion people don’t have enough to eat, and further population growth and climate change are set to put the world’s food supplies under even greater strain. To help ease that pressure, Bruce and other scientists are working to understand and help improve control of crop diseases like FEB. While some crop diseases will worsen in the future, not all will, he stressed. “For example, you might have a disease that is spread by rainsplash in summer and then it’s predicted that there will be far less rainfall in summer,” he explained. 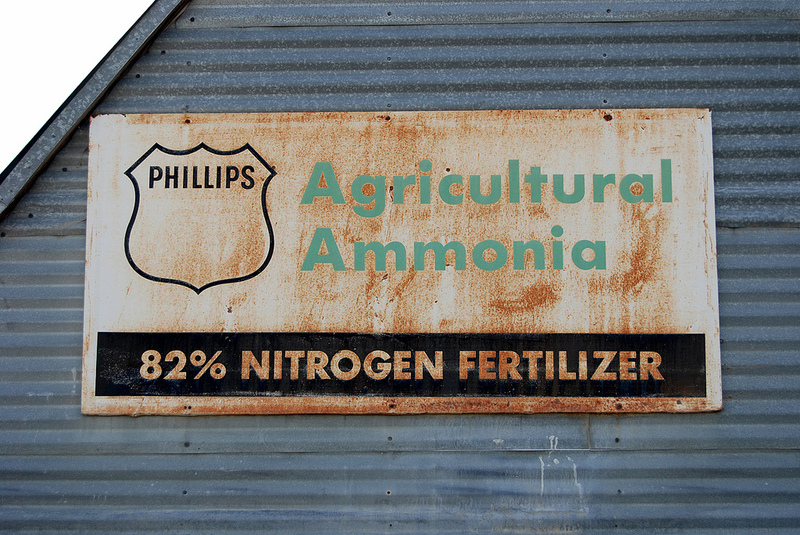 “Then you would expect that with climate change the importance of that disease would diminish.” If governments, farmers and seed suppliers know which diseases are likely to get worse, they can prioritise developing strategies to contol them, like breeding disease resistant varieties. Using MODIS data of red and infra-red emissions from the Earth’s surface Assaf Anyamba and his colleagues can track conditions including temperature and levels of plant growth. 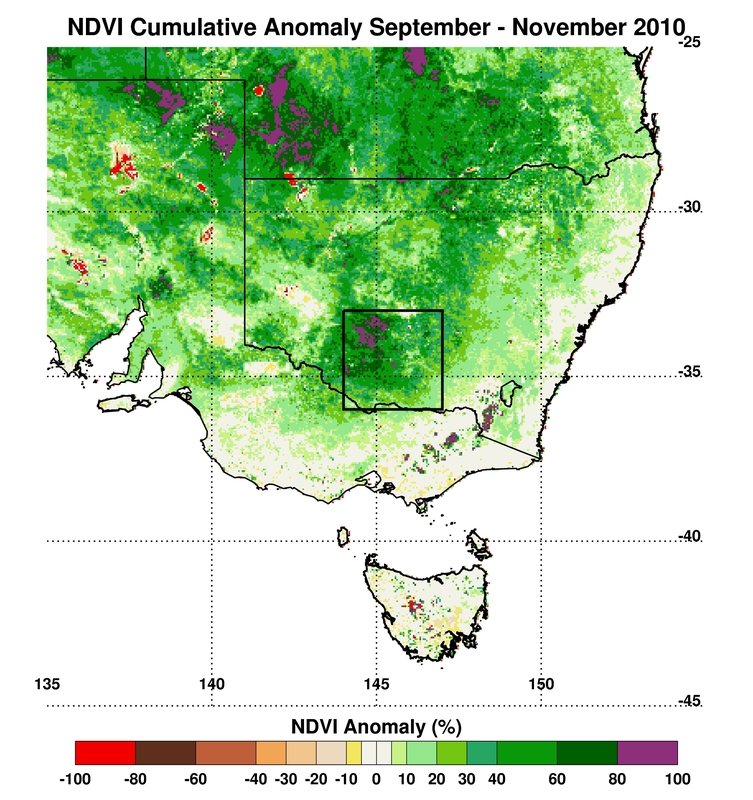 In this shot the Normalized Difference Vegetation Index (NDVI) for southeast Australia from September to November 2010 shows that plants were thriving after a bout of extremely cool, wet weather. 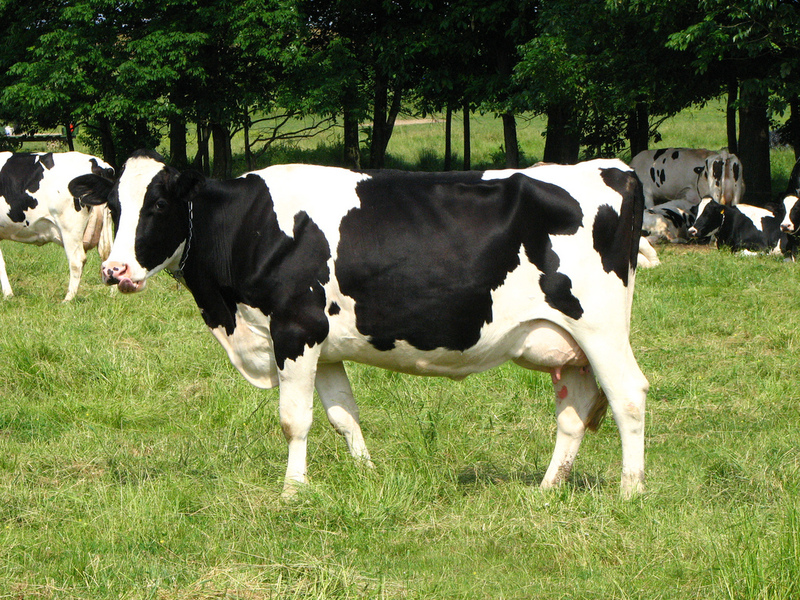 Image copyright: PLOSone, used via Creative Commons license, see reference below. Assaf and his coworkers help provide ways for the US government to closely monitor the whole world to see where droughts or wet periods might be happening. One way Assaf does this is with a pair of ‘eyes in the sky’ – NASA’s Terra and Aqua satellites. Each carries a Moderate Resolution Imaging Spectroradiometer, or MODIS, which precisely records the colours of the Earth’s atmosphere and surface, including those we can see and reaching far beyond. Scientists use the infra-red data it collects to track surface temperatures, while a combination of red and infra-red can tell them how leafy places are. From these, NASA makes this awesome ‘NDVI’ map of how well vegetated crop-growing regions across the world are, while the USDA includes them in monthly Rift Valley Fever risk reports.